When 99.3 County FM went live on air in October 2014, local optician Mark Campbell was between volunteer gigs and looking for a new way to experience his community. Campbell’s wife Heather encouraged him to sign up as a host and he’s never looked back., stating that his best Friday afternoons are always spent on the air hosting and playing a mix music that his listeners love. Each time, he says he feels a rush of energy. 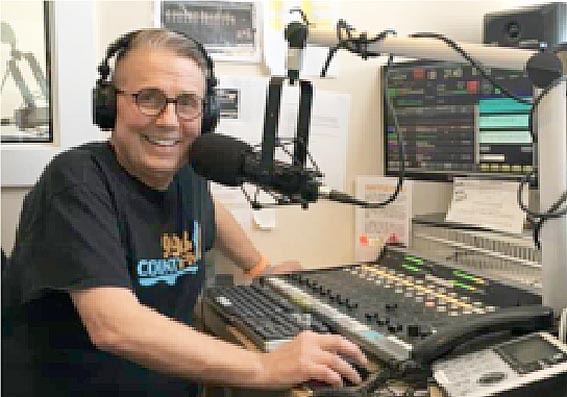 While engaged with a public battle with inoperable lung cancer, Campbell jumped on an opportunity to help pay the station back for his experience by serving as the honourary chair of the station’s annual Radiothon fundraiser April 25-28. He said the volunteer-run station has served as a community builder and enriched the lives of many — both listeners and talent. Campbell is looking forward to the four days of live on-air performances by more than 40 local musical acts. While they’ll provide entertaining radio, there will also be an opportunity to see those performers live in the studio. He added he’s really looking forward to getting the message out that 99.3 County FM is looking to raise money that will help the station repay some of the initial investments that allowed it to establish a studio on Cold Storage Road and get on the air five years ago. To take a leading role in that campaign is an honour for Campbell. “I am grateful to my 99.3 County FM friends to be asked to be honourary chair of Radiothon weekend,” he said. “I will take it seriously and have fun with it too as “Radio should be fun too!” The Radiothon event will actually kick off fifth anniversary celebrations, which will conclude with a special on-air performance Oct. 14. Station manager Craig Mills, a recent addition, said he’s pleased with the way 99.3 County FM has developed over its first half-decade.